Is Swimming Good for the Rotator Cuff? It would appear that the short answer to this question is no. There are two ways to look at this negative answer: first, swimming plays no role in the rehabilitation program for people with rotator cuff injuries and, second, swimmers are at risk of getting rotator cuff injuries because the shoulders play such an important role in swimming strokes. The shoulder socket's structure is less stable than the hips' ball and socket construction, according to the sports medicine department at the University of Wisconsin. Your shoulder movements are largely controlled by the four rotator cuff muscles. These are: subscapularis, supraspinatus, infraspinatus and trees minor. Repeated shoulder movements, particularly in sports, may cause trauma and stress to these muscles. Age also weakens the rotator cuff and tears can occur simply because of degeneration. A damaged rotator cuff often needs surgery. Rehabilitation guidelines for repairing the rotator cuff, clearly rule out swimming, even at 14 weeks after surgery. Swimmer's shoulder describes an injury from shoulder overuse among swimmers. It's also known as impingement syndrome. A rotator cuff tear is one of the possible causes of this syndrome. 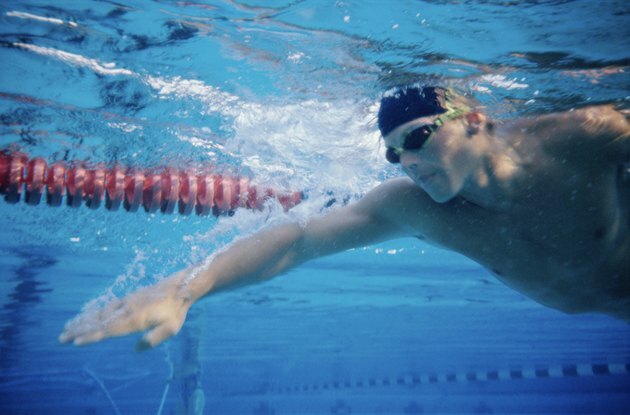 Overtraining and poor swimming technique are two potential causes. Swimmers are more likely to experience painful symptoms during the backstroke and freestyle, according to swimming sports medicine expert Jessica Seaton. USA Swimming recommends swimmers practice preventative exercises to protect the rotator cuff.